I have had my Pike for roughly 3 years. It was passed on to me from my dad who I’m pretty sure bought it from a small local bike shop in Newton Abbot, South Devon some time around 1995. The BB is stamped with “SP 21545” along with the name “COLIN URQUHART” who I can only presume was the original customer. I don’t know anything about the frame tubing or age, but it has Shimano drop outs, a fastback seat cluster and trefoil piercings in the pointed lugs. 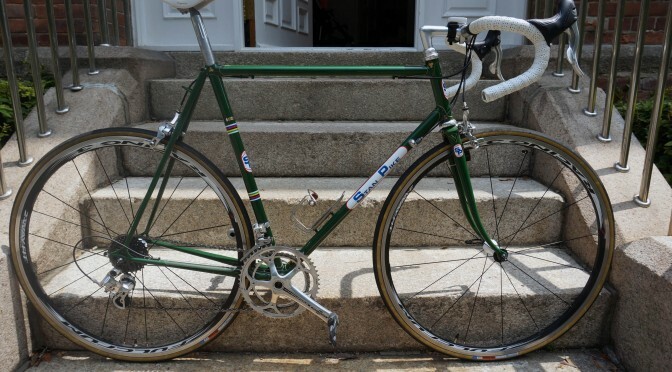 The frame, as I recall was in good physical condition with a bit of a mix of kit on it that my dad set about in most part replacing with quality second hand (near-ish period correct) components. He aquired a number of other quality vintage road bikes in the next decade and a bit, including a high end Pinarello and a USA Team Raleigh but continued to use the Pike on a very regular bases as his main bike, riding in and around devon and Dartmoor on it (including, I think, a 200km audax). 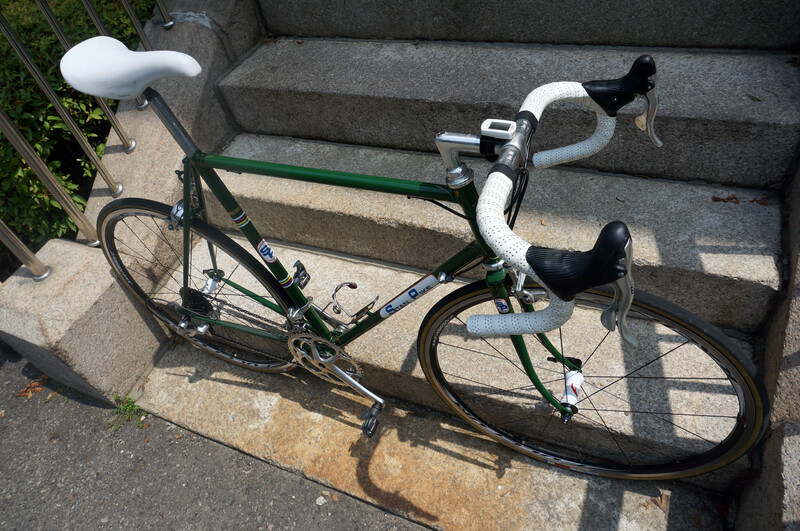 When I got my hands on the Pike in 2010 I kept it as my dad had it for roughly a year, in which time I completed a 24-hour London to Paris ride as well as roughly 1000 km of training and fun, then started slowly refurbishing the frame and updating the kit. I have now updated all but the stem, bars (both Cinelli) and seatpost (campag) to Campag Athena (alloy), a Fulcrum wheel set and a remake San Marco Concor saddle. I also had the frame resprayed in the original mid brunswick green by Argos in Bristol a year and half ago. The bike rides very nicely and is a lot of fun. It was always a lively bike (without being harsh or uncomfortable) with seat tube and head tube angles of 73 and 74 degrees respectively and a reasonably tight rear triangle, but the new wheels have added a more instant reaction to changes of pace and climbing. I’m currently living in Seoul and spend a lot of my ride time heading up or down one or another of the various mountains in and around the city. Most of the local guys that I ride with are on top end modern carbon bikes (and probably think I’m a bit of an oddity) and safely keeping up with them on the winding descents required a much higher performing set of brake callipers than I had previously on the Stan, so this was another of the main reasons for the updating. I plan to take a ride out to Crewkerne when we return to the UK (hopefully Bristol) in a couple of years. 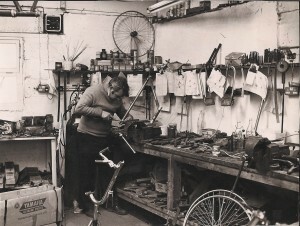 May be even getting the bike back to as close as possible to its place of creation as possible if I can find an address for Stan’s old workshop. I cycled to Richmond park last summer to watch the men’s Olympic road race and just as we found our chosen viewing point I was rushed at by a very excited young man shouting “STAN PIKE”. 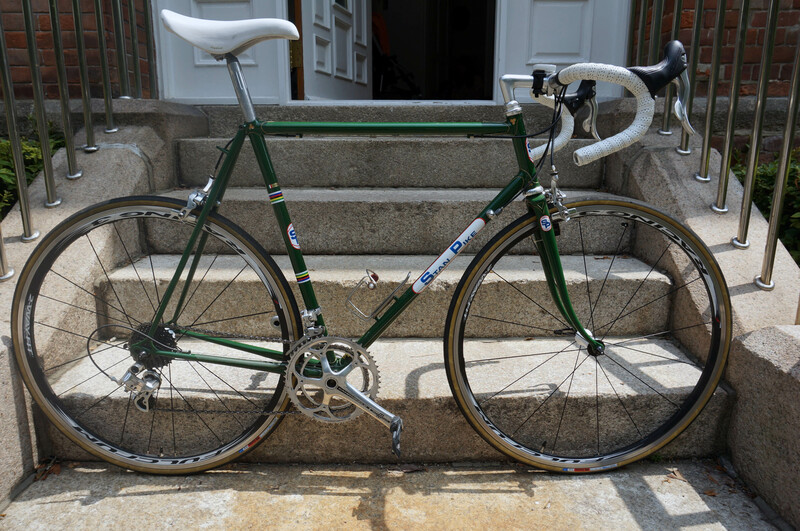 Turns out he had hunted down and bought a Stan Pike frame after reading about him on line and was in the process of returning it to its former period correct glory. And on a number of other occasions I have had strangers come up and comment in a knowledgeable way about the bike and Stan.